Police fired tear gas as fans of rival teams fought in the stands at a Brazilian football game Sunday. The fighting erupted during a match in the Joinville Arena in Brazil's Santa Catalina state, interrupting the game and forcing a helicopter to land on the field to take away an injured spectator. Images from the scene showed people in the stands throwing punches and kicks. One man wielded a metal pipe and swung it toward a fallen fan. Security forces fired tear gas into the crowd. CNN was first alerted to the fight by tweets from Brazil. 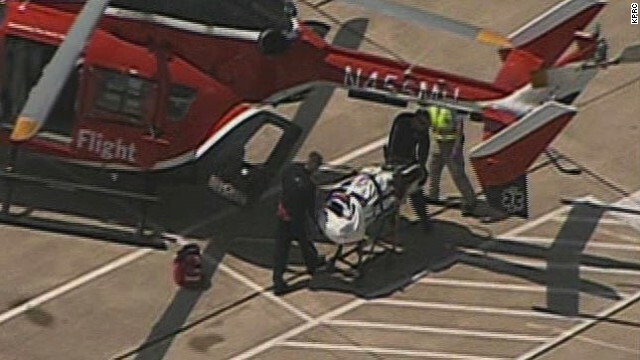 Four victims of Tuesday's attack at Lone Star College were taken by helicopter to area hospitals. Fourteen people were injured - two of them critically - in an attack Tuesday on the Cypress, Texas, campus of Lone Star College, a sheriff said. Authorities first learned about the stabbings after receiving a 911 call at 11:12 a.m. (12:12 p.m. ET) Tuesday describing a "male on the loose stabbing people," Harris County, Texas, Sheriff Adrian Garcia said. The alleged attacker - a student enrolled at the Texas school - was eventually taken into custody. New pope is Argentina's Cardinal Jorge Mario Bergoglio, the former archbishop of Buenos Aires, who takes the name Pope Francis. Election comes on first full day of the cardinals' conclave in the Sistine Chapel. [Updated at 6:25 p.m. ET] That will wrap up our live blog of Francis' debut. For more coverage, check out the links above and read our full story. [Updated at 5:52 p.m. ET] When Pope Francis is formally installed in a Mass later this month, U.S. Vice President Joe Biden will be there, leading the U.S. delegation to the event. Biden is the first Roman Catholic to serve as vice president. Meanwhile, Argentine President Cristina Fernandez de Kirchner has congratulated Pope Francis - a native Argentine - and expressed hope that he will work toward justice, equality and peace for all. A photo from earlier tonight: People react as newly elected Pope Francis appears on the central balcony of St Peter's Basilica. [Updated at 5:33 p.m. ET] We know a little more about what Pope Francis will be doing tomorrow: He and the cardinals will hold a Mass in the Sistine Chapel at 5 p.m. local time (noon ET), Vatican spokesman the Rev. Tom Rosica told CNN. [Updated at 5:16 p.m. ET] A Vatican spokesman says Francis will be a reformer, and will call the church "back to basics." "He knows the Curia, he's been extremely critical of the mess here," the Rev. Tom Rosica said, referring to the Vatican bureaucracy. [Updated at 5:07 p.m. ET] Here's something that a pope has never had the chance to do before today: Shortly after Francis was elected, he placed a phone call to his predecessor, Benedict XVI, who has been staying at a papal retreat at Italy's Castel Gandolfo since he resigned February 28. Benedict, 85, was the first pope to resign in hundreds of years. News of the phone call came from the Rev. Tom Rosica, a Vatican spokesman. [Updated at 4:53 p.m. ET] We've just been given confirmation about which Francis the new pope is honoring in his choice of name. The new pope took the name Francis in honor of St. Francis of Assisi because he is a lover of the poor, Vatican spokesman the Rev. Tom Rosica told CNN. Also, the new pope should be known as Pope Francis, not Pope Francis I, Rosica said. Before Francis was elected, Vatican spokesman the Rev. Federico Lombardi said that the new pope will “very probably” say Mass this Sunday at St. Peter’s and do the traditional Angelus blessing, Lombardi said before the election. It will take several days before there is an installation Mass, because it will take time for world leaders to arrive, Lombardi had said. [Updated at 4:45 p.m. ET] U.S. President Barack Obama has weighed in. 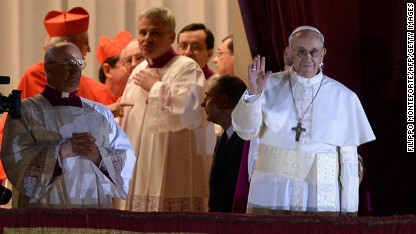 Obama offered his prayers and "warm wishes" Wednesday to newly elected Pope Francis. Obama called him "a champion of the poor and the most vulnerable among us," and also said his election as "the first pope from the Americas ... speaks to the strength and vitality of (that) region." 1) Pope; 2) Jorge Bergoglio; 3) Vatican; 4) White smoke; 5) Cardinal; 6) Catholic; 7) Decision; and 8) Papal. [Updated at 4:31 p.m. 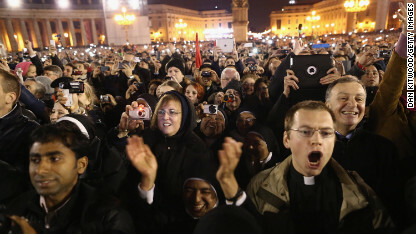 ET] Latin Americans in St. Peter's Square are thrilled. "As a youth, and as a Catholic student, and as a Mexican, I am absolutely overwhelmed with emotion (at) the fact that we have a new pope that will represent that part of the (world)," a woman from Ciudad Juarez, Mexico, told CNN. "That is something very exciting. I feel that Mexico has been a country that has suffered a lot, and so has Latin America, but it is a people that has always put trust in God, so it is absolutely wonderful to represent our part of the world this time around." Beside her, a woman from Mexico City said her heart jumped when she heard the announcement that a pope had been picked. "I'm so excited," she said. "It's a reason of being proud tonight, because Latin America is a very important Catholic area and now it's going to be totally represented here, so I'm so proud and I'm so happy today. ... It's going to help a lot, a Latin American pope, it's going to help. It's going to rebuild many things, and it's a new start." Check out more Latin American reaction here. And the Church of England, the country's official church denomination, offered a prayer Wednesday for the newly elected pope. "Guide him by by your spirit, give him grace to lead people in prayer and zeal, and to follow in the footsteps of Jesus Christ, your son our Lord," the prayer read. [Updated at 4:08 p.m. ET] CNN Vatican expert John Allen has reported previously, for the National Catholic Reporter, that the new pope may have been the runner-up in the 2005 election that saw Cardinal Joseph Ratzinger become Benedict XVI. Allen noted that there's no official account of that election - it is officially secret, after all - but various reports had Bergoglio coming in second in 2005. Pope Francis asked the crowd in St. Peter's Square to pray for him. "Before I give you a blessing, I ask you for a favor - I want you to bless me," he said. [Updated at 3:51 p.m. ET] Choosing the name Francis is powerful and ground-breaking, CNN Vatican expert John Allen says. As noted earlier, this is the first Pope Francis. Also, the name parallels one of the most venerated figures in the Roman Catholic Church, St. Francis of Assisi. Allen described the name of Pope Francis as "the most stunning" choice and "precedent shattering." "There are cornerstone figures in Catholicism" such as St. Francis, Allen said. Figures of such stature as St. Francis seem "irrepeatable - that there can be only one Francis," Allen added. Read more about the new name, from CNN's Michael Martinez. John McAfee, the Internet security pioneer wanted for questioning in the killing of a neighbor in Belize, is now in Guatemala City, said Telesforo Guerra, the former attorney general of Guatemala. McAfee has hired Guerra as his attorney, Guerra told CNN en Espanol on Tuesday. Belize authorities want to talk to McAfee about the November 11 shooting death of American businessman Gregory Faull, 52, who was found dead in his home near San Pedro, on the Caribbean island of Ambergris Caye. On his website, McAfee commented about his relocation: "I apologize for all of the misdirections over the past few days. It was not easy to exit Belize and required many supporters in many countries. 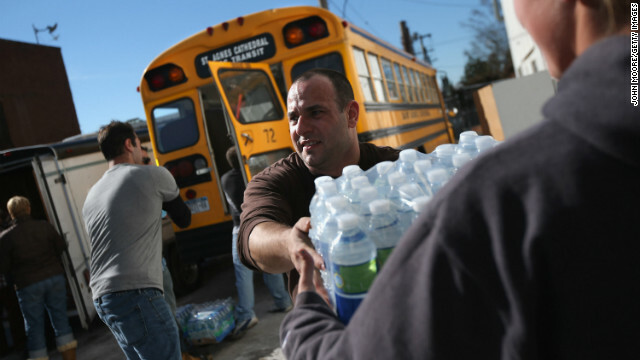 Volunteers unload water at an aid distribution center on Sunday in Long Beach, New York. Editor's note: Six days after Sandy slammed into the U.S. East Coast, the storm's U.S. death toll continues to rise - reaching 110 on Sunday, in addition to two killed by the storm in Canada and 67 in the Caribbean. Click here to read more about the recovery effort. 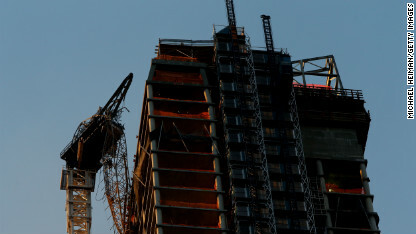 [Updated at 9:47 p.m.] "The operation to secure the boom of the tower crane on West 57th Street is complete," said Tony Sciafani, spokesman for New York's Department of Buildings. Six days ago, high winds from Sandy left it dangling and spurred fears it could fall. But now, "all buildings in the vicinity can be reoccupied," said Sciafini. Editor's Note: Sandy unleashed powerful winds and torrential rains Monday in the mid-Atlantic and Northeast as it sped toward shore. Subways and bridges were shut down and streets were quiet as gusts howled over a huge region encompassing hundreds of miles. At 7 p.m., the National Hurricane Center stopped classifying Sandy as a hurricane, though it still continued to pack a wallop. Here is the full story. [Updated at 10:25 a.m.] Many protesters are calling for the Lebanese government to be dismissed. Protesters are furious with Prime Minister Najib Mikati, a billionaire supported by Hezbollah. Read more here. [Updated at 10:11 a.m.] Former Lebanese Prime Minister Fouad Siniora, on Lebanese TV, said he understands the feeling of anger, but that violence and attempts to enter the Serial - the government palace - are unacceptable. [Updated at 9:52 a.m.] Much of the violence appears to have died down. Video from the scene shows most protesters gathered in a square, chanting and waving flags. 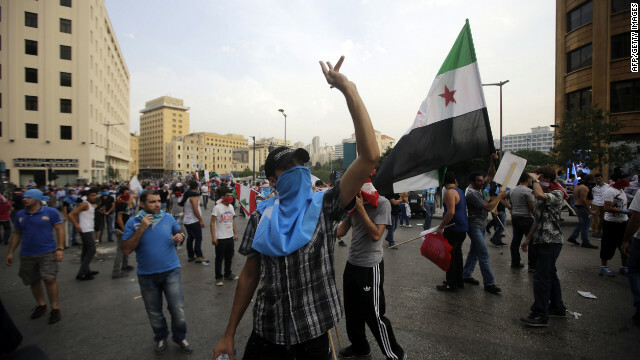 The flags indicate many of the protesters are aligned with the March 14 movement, the anti-Syrian regime coalition that emerged after the assassination of former Prime Minister Rafik Hariri in 2005. That movement was key in forcing the withdrawal of Syrian troops, which had long occupied neighboring Lebanon and pulled out months after Hariri was killed. Some protesters accuse Syria of involvement in al-Hassan's assassination. Syria condemned the blasts very quickly after they happened on Friday. Read CNN's profile of Wissam al-Hassan here. Lebanon's former Prime Minister Saad al-Hariri - Rafik al-Hariri's son - spoke to al-Jadeed TV, calling on supporters to stay away from the Serail, the government palace. [Updated at 9:42 a.m.] Tear gas filled streets of Beirut and gunfire could be heard Sunday as furious protesters clashed with police. Crowds of men - many of them covering their faces with cloths to avoid inhaling the tear gas - wielded sticks and waved flags. Video showed at least one stick set on fire and tossed over a barrier. Reports indicated the gunfire may have been authorities shooting into the air in hopes of breaking up the crowds. Many of the protesters tried to reach the prime minister's office. The violence came after some politicians had called for Sunday to be a "day of rage" in response to a bombing Friday. That attack was the country's most high-profile assassination in more than seven years. Soldiers had carried the flag-draped coffins of intelligence chief Brig. Gen Wissam al-Hassan and his bodyguard through the streets of downtown Beirut. Throngs of people had packed the city's central square for the ceremony Sunday. Friday's attack - in broad daylight, at one of the capital's busiest intersections - left a crater more than a meter deep.